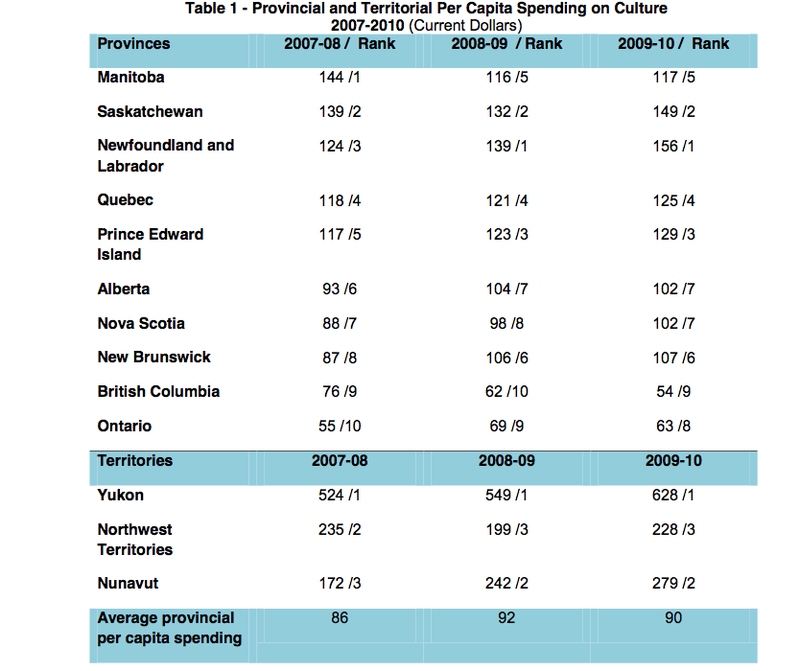 Ever wonder how your province or territory stacks up against other Canadian regions in terms of per-capita spending on the arts? The winner of the race to the bottom is British Columbia ($54 per capita) with Ontario coming in at a close second ($63 per capita). Here in Ontario, public spending on the arts is half that of our neighbours in Quebec ($125 per capita). Arts support in the territories far outranks that in any of the provinces, with Yukon coming in at a very nice $628 per capita. Newfoundland and Labrador are doing well relative to the other provinces, at $156 per capita. The arts are a major contributor to social well being and community cohesion. Many economic studies conclusively demonstrate that the arts also make a substantial contribution to economic development. The regional disparity in arts spending is far wider than I realized, and it was a surprise to me that Ontario ranks so low on this list.